With the game Layers of Fear, I think outside of there being VR support for the game (Update!) or maybe a sequel some time in the future, this is perhaps the closest anyone will ever get to feeling the experience of living a Nightmare movie. This game is crammed full of amazing visuals, creative scares, and fun, mind-bending landscapes and portraits. A secondary way of describing it, though not nearly as accurate, is that it’s a little like a haunted house simulator, which I’m sure sounds just as fun for many of you all the same. However, if you’re not into exploration or “walking simulator” type games or have never played one, this might not be your cup of tea. These are minimalist games that are more about the experience and story than action and gameplay, so at no point will you be shooting a gun, driving a car, or blowing anything up. Mostly, you’ll be walking from room to room, opening doors, looking in drawers, looking at paintings, reading notes, etc. These games are a little reminiscent of the old text-based or point-and-click games, which as a console gamer mostly, I never really got to enjoy first-hand. Believe me, I enjoy the fast-paced action of a Call of Duty or Grand Theft Auto game as much as the next gamer, but it all gets a little old sometimes. Honestly, just walking through a spooky house doing pretty much nothing, as boring as that might sound on paper, is actually a huge breath of fresh air. I’d have to say that the first truly proper exploration game that I played was Gone Home and I had no idea what to expect, but was surprised at how much I enjoyed myself. I have so many movies, TV shows, games, etc. backed up on my list, that things often get put off for a long time, years really if I’m being totally honest. But lately, I’ve just been on a roll, blazing through many of these games that had a pin stuck in them for so long. I just made my way through Among the Sleep, Dear Esther, and most recently, Layers of Fear. Next up, I’ll be working on The Vanishing of Ethan Carter and Everybody’s Gone to the Rapture. It wasn’t so long ago that the thought of having 5 horror games to play back-to-back was just a dream, that only 5 good or okay horror games might come out in a whole decade. Now, there are so many, the only complaint is that there’s simply not enough time to play them all. 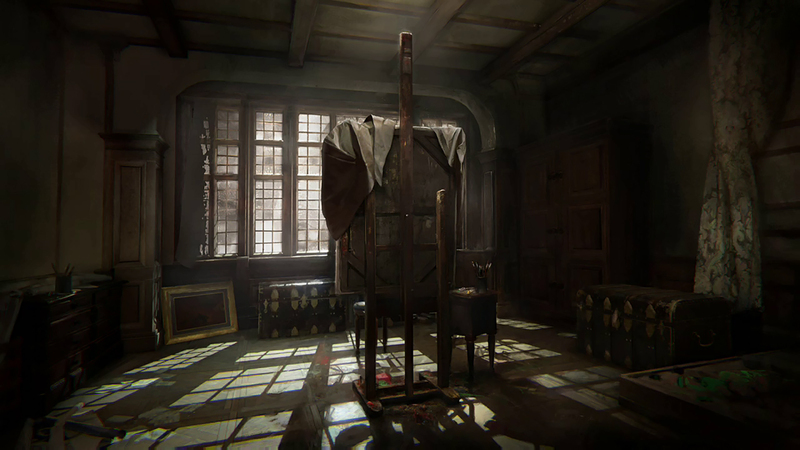 While I’ve enjoyed them all so far, I was most compelled to share my thoughts and recommendation for Layers of Fear. Especially since it seems to be the least known or talked about of the bunch, really going under the radar. I can’t quite claim that this is the scariest game I’ve ever played, as either Amnesia or Outlast would definitely take that title, but it’s absolutely in the top 5 scariest games I’ve ever played and is, by far, the most beautiful, psychedelic, and creative game I’ve ever played. The other thing that I really appreciated about it, is that instead of the tired “tortured writer” cliché of so many horror stories, at least we get a tortured painter and a tortured musician this time around, which makes for incredibly rich aesthetics and a wonderful soundtrack being relevantly and excellently interwoven into the experience. And decide for yourself if it’s something you want to dive into. On a final note, if there are any games like those listed here that I haven’t mentioned and that you consider must-play, I’d love to hear those recommendations in the comments below. UPDATE — While it seems only fitting to post this today, on the date that the original Nightmare on Elm Street film released, I had no idea, complete and happy coincidence. ← Challenge Week #4 – 31 Films. 31 Days. Happy Halloween!